PASADENA, Calif.—R.D. 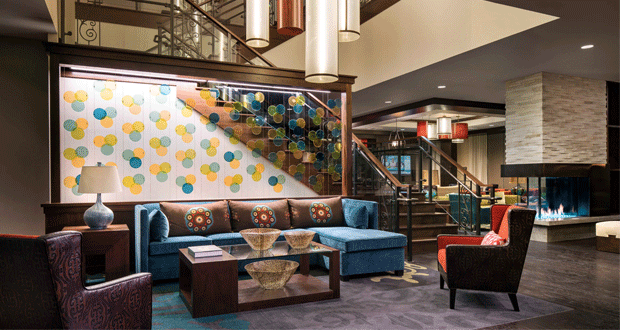 Olson Development, in partnership with Joseph Martelli Real Estate Investments, has opened the five-story, 144-room Residence Inn Los Angeles Pasadena/Old Town in Pasadena, Calif. Executives from R.D. Olson Development, Marriott International, and project general contractor R.D. Olson Construction joined civic leaders at the grand opening. The project marks the first hotel development in the historic Old Town Pasadena area in 15 years. Located in the heart of Old Town Pasadena, Residence Inn Los Angeles Pasadena/Old Town is walking distance to a variety of entertainment options and eclectic cultural offerings. The hotel is also within one mile of the famed Rose Bowl Stadium and nearby the prestigious California Institute of Technology, historic Dodger Stadium, and entertainment hubs such as the Staples Center, Nokia Theater, and Hollywood. The hotel’s design elements are a playful rendition of the arts and crafts heritage of Old Town Pasadena, blending iconic period fixtures with modern detailing. The Craftsman style of interior architecture that is prevalent in many Pasadena historical homes is represented in much of the hotel’s detailing, including a hand crafted stairway with wood and forged metal railings, which stands out as a focal point of the lobby space. The hotel’s wood beams and warm color tones colors offer Craftsman and Bungalow-style undertones, and a handmade glass screen reflects Pasadena’s sentiment for artistic work and handicraft. A large, handmade wall relief of an oak tree, made of real oak by a local artist, represents the Pasadena’s landmark Cathedral Oak tree that once divided Orange Grove Avenue in 1890. Pasadena’s Colorado Bridge and Tournament of Roses Parade are also represented in artwork and vintage images throughout the hotel. Offering a comfortable, stylish retreat, the property’s interior pairs Pasadena’s rich history with the conveniences of Marriott’s latest Gen 9 Design, showcasing contemporary furnishings within a traditional, historically-inspired setting. The hotel’s exterior weaves in subtle Mediterranean architecture and design elements through the use of parapet and tiled gable roofs, hipped-roof corner towers and plaster walls. Additionally, a variety of window openings are highlighted, including groupings of punched, multi-story windows which allow ample natural light into the building. The 94,091-square-foot, all-suite hotel is designed with a room mix that includes expansive studio, one- and two-bedroom guest suites, complete with kitchens and upscale bathrooms to accommodate the needs of the extended-stay guest. Guestroom suites offer separate living, sleeping, and working areas, as well as kitchens with high-end appliances including a refrigerator, stove, microwave and dishwasher. Rooms also include spa-like bathrooms and ergonomic furniture, creating a relaxing, home-like environment. Guests benefit from a variety of public amenities such as a complimentary breakfast buffet, a fitness center with CrossFit style equipment, complimentary high-speed Internet access throughout the property, a business center equipped with the latest technology solutions, and guest laundry. The property also features a 24/7 Market, which provides easy access to grab-and-go snacks and other on-the-go necessities. Residence Inn Los Angeles Pasadena/Old Town offers a variety of outdoor spaces for guests to relax and reenergize amongst the beauty of Southern California. Amenities include an elevated deck with a pool and spa, outdoor play spaces including a sports court, a grilling area and barbeque, and large fire pits that offer a perfect spot for an evening beverage. The property’s 850 square feet of versatile meeting space enables guests and community members to conduct dynamic events or family gatherings. San Diego-based Awbrey Cook Rogers McGill Architects served as the architectural firm for the project with interior design by Seattle-based Degen & Degen.